4 Bedroom Detached House For Sale in Hayle for Guide Price £800,000. 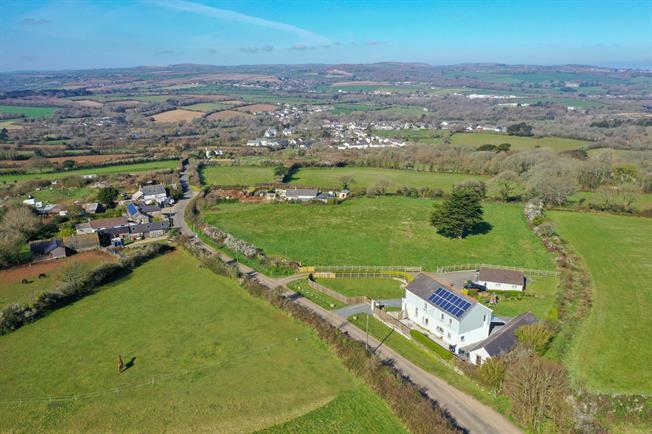 Steppy Downs House & Sunset are a delightful pair of detached properties set in an elevated position enjoying far reaching sea and coastal views from Mounts Bay to Lelant estuary. Steppy Downs House, the larger family home, is presented to a wonderful standard throughout and provides spacious, light and airy living accommodation as well as generous bedroom sizes and quality fitted bathroom suites. At first floor level there are 4 generous bedrooms with the master bedroom providing en suite bathroom facilities. There is also an airing cupboard and family bathroom with bath and separate shower cubicle at first floor level. The far reaching views only improve on this floor and the large double glazed windows help allow plenty of natural light into the bedrooms. Located across the driveway from the main house is a detached two bedroom bungalow known as Sunset. This charming and spacious bungalow offers a variety of uses to any potential purchaser ranging from holiday letting income, short-hold tenancy or housing a dependent relative or family member. The accommodation in brief comprises of an entrance hallway leading to all of the accommodation within the bungalow. The open plan kitchen / dining / sitting room is located on the left hand side and again provides far reach rural and coastal views. The two bedrooms are generous double bedrooms and the family bathroom provides a bath and separate shower cubicle. There is a charming garden which wraps around the bungalow and a patio seating area located outside the sliding patio doors from the reception room offering a sheltered spot to sit and enjoy the vista. There are two driveways leading to both the main house and the bungalow therefore allowing separation of the areas should anyone wish to rent either property out and have a defined boundary. Each property has its own unique garden space with Steppy Downs House having the larger garden mainly laid to lawn. Also located behind Steppy Downs House is a detached workshop / outbuilding which has been loosely split into two sections. This workshop has power, lighting and drainage therefore should any potential buyer wish to seek permission to convert this building into further accommodation all the services are provided. Completing this fantasitc set up is an enclosed 3 acre paddock which is stock fenced and provides separate road access. The properties stand in an elevated countryside setting surrounded by a rural landscape. The commands wonderful panoramic views and have no immediate neighbour. St Erth is the nearest village and provides a range of local facilities including general store/post office, the 16th Century Star Inn and a junior school together with a mainline train station to London Paddington. More extensive amenities can be found in the nearby town of Hayle or slightly further afield, Penzance. Steppy Downs House and Sunset are well positioned for ready access to a number of other sandy beaches on both coastlines including the waters of Mounts Bay, Gwithian and St Ives. The following services are available mains electric, metered mains water, private drainage and telephone line is connected (however we have not verified connection). Hot water is catered for via immersion tank and heating is modern electric radiators in both properties. There are solar panels on the roof with a feed in tariff.